Pregnancy Wheel is a medical app. by Dave Duprey that is basically a circular slide chart that helps you determine your probable delivery date if you are pregnant. The chart is pink, purple, and white with months along the outer edge of the circle and important info in the center of the circle- today’s date, age of the baby, which trimester you’re in, current crown rump length, and current bpd (biparietal diameter). In between the months and the center are important markers, like date of last menstrual period, conception date, start/end of 2nd trimester, start/end of 3rd trimester, and due date. Next to the due date, the astrological symbol for the baby appears to the right of the date. For example, if a child was conceived today (7/6), it would be born on approximately 3/29/2011 and would be an Aries. The wheel also shows approximate time periods where certain tests should occur. The medical tests that appear on the wheel are for GDM (Gestational Diabetes Mellitus), GBS (Group B Streptococcus Screen), and the Screening Ultrasound. There are also genetic tests on the wheel- NT (Nuchal Translucency), FTS (First Trimester Serum Screening), and MSS (Maternal Serum Screening). CVS (Chorionic Villus Sampling) and AMNIO (Amniocentesis) also appear on the wheel. If you tap the center of the wheel, a teardrop pointer will appear that remembers the last position you set. There is a small “i” icon in the upper right hand corner of the screen that gives instructions on how to use the wheel and explains the acronyms used on it. The info section is also very careful to point out that this app. should NOT be used as a substitute for a clinical opinion and that all numbers and dates that appear on the app. are approximate. Although I have never used a real pregnancy wheel, I feel like this app. is straightforward and simple to use. I like that there is only one screen that contains all the information you should need and then has the supplemental info icon for reference. However, this is the most expensive pregnancy wheel/due date app. that shows up in my search in the app. store- most others are in between Free and $2.99, while this one is $3.99. I would only pay that much for an app. that I felt like I could use over and over again, and I don’t think the this app. falls into that category (even if I was actually pregnant). However, if you don’t mind the price, then I think you will be very happy with Pregnancy Wheel. 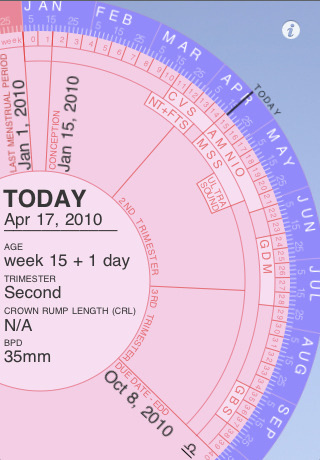 AppSafari review of Pregnancy Wheel was written by Tyne Kennedy on July 8th, 2010 and categorized under App Store, Calculators, Health, Reference. Page viewed 6611 times, 1 so far today. Need help on using these apps? Please read the Help Page.